Amazon.com description: Product Description: Facing annihilation at the hands of the warlike Vogons? Time for a cup of tea! 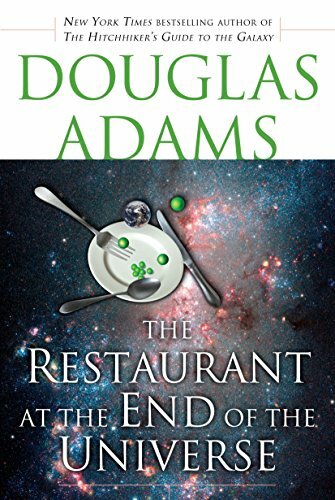 Join the cosmically displaced Arthur Dent and his uncommon comrades in arms in their desperate search for a place to eat, as they hurtle across space powered by pure improbability. Among Arthurâs motley shipmates are Ford Prefect, a long-time friend and expert contributer to The Hitchhikerâs Guide to the Galaxy; Zaphod Beeblebrox, the three-armed, two-headed ex-president of the galaxy; Tricia McMillan, a fellow Earth refugee whoâs gone native (her name is Trillian now); and Marvin, the moody android. Their destination? The ultimate hot spot for an evening of apocalyptic entertainment and fine dining, where the food speaks for itself (literally). Will they make it? The answer: hard to say. But bear in mind that The Hitchhikerâs Guide deleted the term âFuture Perfectâ from its pages, since it was discovered not to be!